I have read MANY fics where the fix author seems to believe that Ranmas Cursed Form does not seem to age, or at the very least ages slower than her normal body. Now I can certainly see where people would get that impression what with P-Chan for example who obviously does not seen to age given the rate pigletts generally grow. But two things first it is more likely that Ryoga cursed form is more than likely a Pot Bellied Pig. And second and this is for Ranmas cursed form, it has been shown that Ranmas curse at the very least GROWS at a normal rate. This is because of the chapter where akane is happy about her chest having grown and ranma-chan having grown as much to stay AHEAD of her to the same point. Now I would like ANY supporting evidence to this. As well as any evidence to the contrary. HopeSeiketsu wrote: I have read MANY fics where the fix author seems to believe that Ranmas Cursed Form does not seem to age, or at the very least ages slower than her normal body. Well, as you mentioned, Ranma does age physically as a girl. There isn't anything that implies the opposite. The not aging thing is usually a plot tool for some purpose rather than based off anything in canon. While it's illustrated that enough time has passed for more than one girl's breasts to grow, there's still the continuity problem (and the series ending where it did), so we don't know if Ranma will age beyond the definition of "young," or if his cursed form will only grow to the point where going any further is no longer considered young. If I remember correctly, Ryoga's a baby black pig, so we'd probably notice more growth in him in the time that it took for their breasts to grow, yet he doesn't seem to have grown at all. Meh... The only premise the authors of non-aging stories have for Ranma remaining a girl is the fact that it was 'spring of drowned girl', not 'spring of drowned female'. The curse taking it literally and forcing Ranma to remain as a 'girl' rather than a 'female'. Keep in mind the growth in series could still be valid by this logic, since we never really see Ranma as an 'adult'. note I'm not saying I do or do not agree with the premise, but I've seen it enough over the years and not really refuted by canon that I'm willing to give benefit of doubt. One of the funny things about adulthood is that it can vary. If we go by law, Japan would give Ranma up to the age of twenty to stop growing, if the curse recognized such a thing. Biologically, one can -- not should, mind you -- be considered an adult as soon as they're able to produce offspring. All of the cursed individuals -- save Ryoga -- are well into puberty or older in their cursed forms, though, so we can rule that one out. There's still the end of puberty, though, or maybe even the end of all major growth. I wonder if the curse would follow our perceptions of adulthood or nature's processes. Crescent Pulsar S wrote: While it's illustrated that enough time has passed for more than one girl's breasts to grow, there's still the continuity problem (and the series ending where it did), so we don't know if Ranma will age beyond the definition of "young," or if his cursed form will only grow to the point where going any further is no longer considered young. If I remember correctly, Ryoga's a baby black pig, so we'd probably notice more growth in him in the time that it took for their breasts to grow, yet he doesn't seem to have grown at all. The curse isn't "young" anything. It's just spring of drowned girl. No, but strongly implied. 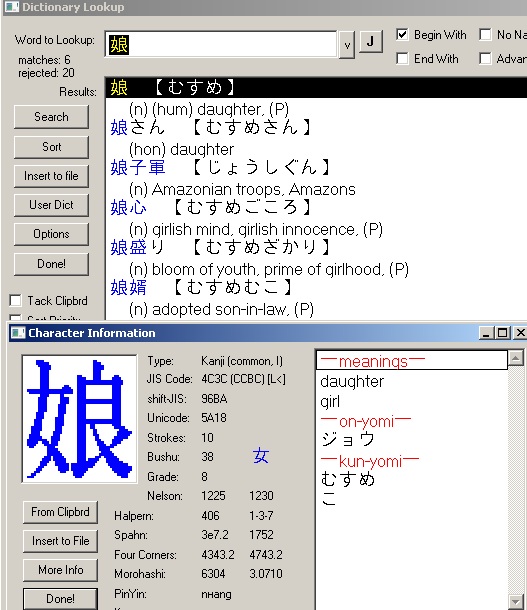 The key kanji reads in Japanese as "musume". Last edited by Cheb on Wed Aug 02, 2017 9:55 pm, edited 1 time in total. LawOhki wrote: The curse isn't "young" anything. It's just spring of drowned girl. That's young enough, isn't it? At some point a girl becomes a woman. Granted, at least in English, "girl" has some rather broad usage, but it's especially attached to "child" and youth. Also, I believe that may be the case -- to a lesser extent, I think -- for the usage in the native language. It was a while ago that I looked the Chinese stuff up, though, so I could be wrong about that. Why does it even matter? IT'S MAGIC!!! THere's no need to attach logic to it. THe only thing we know is that Ranma's brests have grown and nothing else. Maybe Ranma has been eating more and all the additional fat went into his breasts. Who knows? Daughter/young girl but upon asking a japanese speaker he said it does not have a strict age definition and since it's really being used as a chinese word, that connotation has even less importance. Now I can certainly see where people would get that impression what with P-Chan for example who obviously does not seen to age given the rate pigletts generally grow. But two things first it is more likely that Ryoga cursed form is more than likely a Pot Bellied Pig. Actually, the way it´s portrayed, i´ve always assumed his form is that of a minipig, after checking translation it seems "miniature pig" is the proper English name, the smallest of which are only around 10-25kg fully grown. So, potentially no real actual growth required. I could be wrong but i don´t think there is anything that could be called "evidence" in either direction. The series simply covers too short time to be able to give evidence. So while i´m entirely happy if authors abuse any variation on this, it´s basically "fair enough". Possible supporting evidence for weird curse aging: Whatsisname who Happosai stole the Butterfly Brocade from. Didn’t he get himself cursed with some sort of Very Young Boy spring in order to get girls to drop their guards around him? Or am I remembering something from the anime or some fanfic instead? Either way, it’s possible he only did it recently and is growing normally… Really, I’d say it’s up to Authorial Fiat. Do whatever works for your story. gsteemso wrote: Possible supporting evidence for weird curse aging: Whatsisname who Happosai stole the Butterfly Brocade from. Didn’t he get himself cursed with some sort of Very Young Boy spring in order to get girls to drop their guards around him? Or am I remembering something from the anime or some fanfic instead? Either way, it’s possible he only did it recently and is growing normally… Really, I’d say it’s up to Authorial Fiat. Do whatever works for your story. He took a dip in the spring of drowned child specifically to regain his youth but he ended up too young. No indication of when it happened. Although he immediately jumped to using his youth to get back at Happosai so probably very little time elapsed between curse and showing up. Well, we have seen the curse getting older, Ranma chan got taller and with a bigger bust by the end of the manga after all, and acording to the author, by the end of the manga, is only been a year since Ranma arrived to Nerima. The thing is, there is also a curse spring in the manga that turns you into a young boy. And the things are curses, so to find out how Ranma curse will age is conplicated. There is still the fact that Ryoga's curse did not grow up, so I think is up to the writer interpretacion. If Ranma female form stop aging at nineten years old it could work I think. Since back then you had to be twenty to be an adult so Ranma-chan would not be a musume anymore.